Well, wow. It's been quite some time since I've raced through books at this pace, reading all three in less than a week, and not a vacation week! 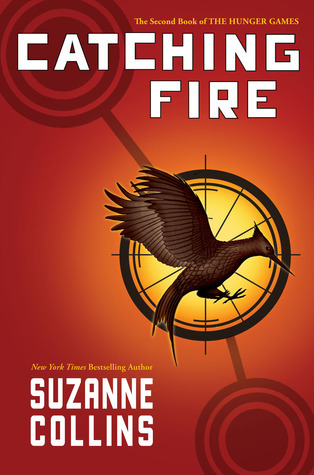 Catching Fire was very interesting, continuing on the same sort of plotlines as the first novel, yet at an accelerated and possibly more suspenseful pace. 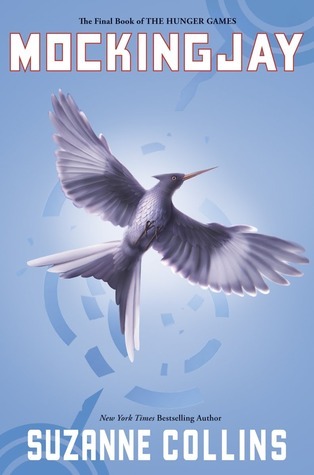 The final book, Mockingjay, really took the story the only place it could conceivably go, and while I predicted the climax, that somehow didn't make it any less intense. Yes, this series is almost entirely plot driven, with characters sketched out in the starkest of terms, but it's a stark story about a stark existence, so it works. And now, if you have not read these books and there's even the slightest chance that you might pick them up in the next couple years (and I recommend you do), stop now, because I don't think I can discuss them in any depth without spoiling them for those that haven't read them. So, here's your warning. Catching Fire is a lot like the Hunger Games since it involves the Quarter Quell a more intense set of Games held every 25th year, and Peeta and Katniss have to participate again, conveniently. When the plot took this expected turn, I was a little concerned, as I didn't really want to read another account of surviving the horrid games, but luckily, these were different, with a strange alliance forming among the tributes. That everyone had to be manipulated by other forces, either the Capitol or the Rebellion, was a little much. In some ways, it made sense that Haymitch and others trusted these two teenagers with so little of the greater plan. On the other hand, with them risking their life as they were, and since they were supposed to be fairly clever, it seems a little too much that they absolutely had to be controlled and let in on very little of the master plan. While it may have made for some suspenseful reading, I think it could have been just as suspenseful had the main characters known their ultimate purpose. By Mockingjay, I was definitely tired of the love triangle. Luckily, there wasn't too much harping on it, since Peeta was absent through most of the first half, and just plan mad through most of the latter. Gale's militaristic tendencies came out with perhaps too much force, but much of that was set in the earlier two books with his comments against the Capital and talk of organizing an uprising in the mines. I am really not sure why it seems many people hated this book; I can't say where else the plot could have gone without ending in the bleakest of ways. I definitely appreciated that President Coin was painted as just another version of Snow, with her own agenda for seeking power by any means possible, using her own rebel people as disposable pawns to be manipulated into doing her will. As soon as this image of her began to emerge, the reader can easily predict the climax, although not necessarily the denouement and conclusion. I originally did not appreciate what happened to Prim, thinking it a poor plot device both to play on the reader's sympathies and move the plot in a different direction, but I felt the explanation - Coin's willingness to do whatever it took to keep Katniss in line and to retain power for herself - ultimately made sense in the context of the story. I did thoroughly enjoy this book - this trilogy, really, and it's views on power and human resilience. Yes the characters were a little unreliable and unpredictable, but in situations of great stress and dire circumstances, how could they behave consistently and predictably? I do wish there was at least a little character growth, beyond Katniss succumbing to Peeta's affection and eventually creating a family. She seemed mostly a pawn, after all that. She was mostly exploited and carefully maneuvered into everyone of her honorable choices, so that they weren't necessarily her choices at all. I'm not sure what this says about a strong female character. Further, gender issues were pretty much a non-issue in this dark dystopian future. Women were often in command in military operations, and men never seemed to have a problem with women in positions of authority. It was never discussed as being odd or out of place. They were not beyond corruption, as in President Coin's case. But then... the characteristics that seemed most valued - aggression, perseverance, physical strength and fortitude, military strategizing, fighting, surviving against great physical odds, hunting, etc - are all characteristics that are considered to be stereotypically masculine. Only one revered ability - healing - is generally thought to be a stereotypically female quality. Small criticisms really. I can't seem to get away without pointing out flaws. But writing is an extension of our humanity, and we are far from perfect - so there must always be flaws to find. Overall, though, a fantastic trilogy that might make you think a little about the plight of human greed and power dynamics, if you let it. If you don't, it's still very entertaining. I always love your reviews. I only wish I could express what I've found in books I've read like you seem to do. I've still been hestitant about getting the series. I feel like I must before the movies are out and it's the only thing I hear and see. I certainly trust your judgement and realize that you read the entire series in lightening speed. I'll take a look at them again the next time I visit the bookstore. I think that a bit of criticism, even if you really enjoy something, is healthy. At least you're removed enough to still analyze it in a constructive way. Well, maybe not constructive, but a way that expresses the ideas you desire to see in the material. I feel the same on a lot of these things. I thought Mockingjay was a fitting close to the series, and like you write, I don't see how else Collins could have ended it without suggesting the bleakest of futures for her characters. So many things about this book made me feel retrospectively hopeless for Katniss and everyone in her world - that everyone in the books, including Katniss, seems to be little more than a pawn to someone else. Doesn't make for great moments of character development, but I think it serves the plot well. I'm psyched, again, that you liked these...I am trying not to reread these for a while longer (few things worse than a too-early reread that leaves you bored with books you loved the first time) but all your posts about them have made me want to give up and start right this second. Beth - Yes I completely understand your hesitation, as I had the same reluctance. Have I mentioned that it took me almost 2 years since they were first recommended to start the series? Get them when you're ready; I doubt you'll be disappointed. And I'm glad you like my reviews! Half the time I feel it doesn't quite come out the way I'd intended, but as long as it resonates with someone, that's all that really matters! Ellen - I'm glad you agree about the appropriateness of the final book. How long ago did you read them? It is a little hard finding the next thing to read after finishing them... I needed something just as engaging, or at least close to!